Why does Woody Allen keep doing this to me? If you asked me to list my top 20 films of all time, after much deliberation either Annie Hall, Manhattan, Sleeper or even all three could, justifiably, end up on the list. The man as an actor, writer and director will always have a place in my heart, but over the last decade it's like watching one of your favourite bands continuously release a new album every single year and wincing and cringing of how bad it progressively gets after an okay start. Though his latest film, You'll Meet A Tall Dark Stranger doesn't quite match the heights of mediocrity we saw in last year's Whatever Works it does see the revered film-maker suffer the same pitfalls of his past works in recent times. Once again Woody Allen takes his cinematic world tour outside of his comfort-zone, New York to London where he tells the tale of a miserable, overtly middle-class family along with the connecting relationships to the loved ones in their lives. In one corner there's Alfie (Anthony Hopkins) who grows tired of his complacent life with his wife, Helena (Gemma Jones), regressing into a bizarre mid-life (or should that be later life?) crisis, leaving her for a much younger woman, Charmaine (Lucy Punch). This results in Helena losing it a bit, consulting a fortune teller for existential questions regarding everyone she knows. All the while there's Alfie and Helena's daughter, Sally (Naomi Watts) who is fed up of her stalemate marriage with struggling author, Roy (Josh Brolin) as he attempts to come to terms with being a failed writer. Roy and Sally's eyes start to wonder also towards an alluring neighbour (Freida Pinto) and Sally's boss, Greg (Antonio Banderas) as their marriage starts to also fall apart. Keeping up so far? One of my main problems with Allen's films set outside of New York is, he tends to overly romanticise the locations he's shooting in. He did it with Vicky, Cristina, Barcelona, he did it with Match Point and he's doing it yet again with this. Even for Josh Brolin's character, the whole struggling writer angle - haunting premonition though it was - wasn't entirely relatable. Even during his lowest moments of the film, there was never any real hint of desperation or true financial strain on his part. It was all very merry and stereotypically British as oppose to being actually British, especially in these harsher economic times. In this instance Allen is failing to understand his characters and the locations he places them in. Attractive looking though it may all be. Personally though I thought performances were fairly spot on and even quite enjoyable, even if the script they were working from was completely haphazard at times. I did get the impression, Anthony Hopkins and Antonio Banderas' characters were underused never getting the chance to truly explore their personal conflicts. On a technical level, the style was very much Allen's especially with the trademark opening and closing credits - which contained a delightful rendition of When You Wish Upon A Star - but unfortunately it lacked any real merit of actual comedy. Yes I know, even his best films, arguably, aren't "ha ha" funny, more an ironic kind of funny, but there wasn't even enough stock in the eccentric characters on display to truly care whether they stayed miserable in one marriage or the next. It was almost like watching Woody Allen trying to satire Mike Leigh and failing quite badly at it. Yet again Woody Allen's complacency comes into question with another phoned in display. 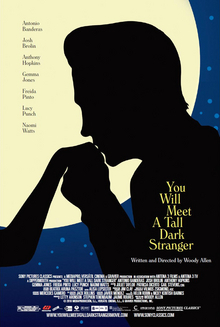 While You'll Meet A Tall Dark Stranger is quirky enough, it fails to strike a balance of being an engaging dissection of modern relationships as well as simply being an enjoyable comedy. He better hope Midnight in Paris is an absolute classic otherwise I'm calling time on his career. Really, I mean it this time. You'll Meet A Tall Dark Stranger is in selected cinemas throughout the UK now. Alternatively American visitors can just purchase it on DVD and Blu-ray. Oh no!! I really liked the 'mediocre' Whatever Works!! But then again I am quite a late comer to Woody Allen's work . It is certainly better than Scoop which felt too mainstream coming from Allen. I still enjoyed it though. I didn't enjoy Vicki, Chrsitina at all though. Something bothered me with that film which I can't define. It was almost as if Aleen was trying to shock us and by doing so has shown himself out of touch with the times. We of the Saw and Hostel generationaren't shocked anymore and Allen feels like he has misse the bus with Vicky. Don't get me wrong Saw And Hostel are garbage and far from my cup of tea...but they don't make Whatever Works look so medicocre do they??!! !